Eclipse XML Validation can BITE ME – Planet Geek! There are times when I want to take an axe to Eclipse. Today’s particular grief is due to the XML editor. There are numerous faults with it (one of the biggest is that it ‘captures’ the control-pgup and control-pgdn keys into local tabs, so if you have an XML file open, and you use the keystrokes to navigate through your files, when you switch tabs to an XML file, the only way you can view a different file is to click on it), but todays stabbity-stab comes from the validator. Eclipse shows you errors and warnings in realtime. Usually, they’re fairly accurate. Today I was editing a struts.xml file, and was getting a validation warning. When Eclipse senses a problem with the XML (based on it’s DTD), it tells you “this XML file fails the DTD validation”. But it doesn’t tell you where. document type does not allow element "include" here. Was that really that difficult? Picker / Selector for GSM phones? oXygen rocks so hard it’s in danger of breaking the spacetime continuum. If you can reliably reproduce this, I would suggest opening a bug report with eclipse. You also don’t mention what version of eclispe your are running. There are a LOT of errors in eclipse wtp 2.0, eclipse wtp 3.0 is much better, but still not perfect. Feel free to drop me a note, I’m a committer on the eclipse XSL Tools project so glad to help work through any issues. I have created one editor. 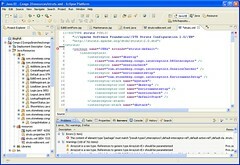 Now i want to add the capabilities of xml editor like validating and xml content assistant to my editor. How can i do that. please can anybody help me. I am eagerly waiting for the reply. Thanks in advance. Akbar: Do a google search on XML Editor EclipseCon 2006. That should take you to a tutorial on doing what you want.